This page presents a report of the inauguration of Berlioz’s statue in Square Vintimille (now Square Berlioz). The original text of this report and the accompanying image were scanned from our own copy of the 23 October 1886 issue of L’Illustration, and are reproduced below together with our English translation of the report. NB: Berlioz died on 8 March 1869, and not on 9 March; the statue was inaugurated on Sunday 17 October 1886 and not on 18 October, as is stated in the article (the 18th was a Monday). Inaugurated in Paris on 17 October. The inauguration of the statue of Berlioz, the work of the sculptor Alfred Lenoir, took place last Sunday, 18 October [17 October in fact], at Square Vintimille, next to Rue de Calais, where the celebrated composer lived for a long time. Berlioz’s life is too well-known and has recently been related in excessive detail by the press for us to have to go into details which would hardly be news to anyone. Just a word about his statue. 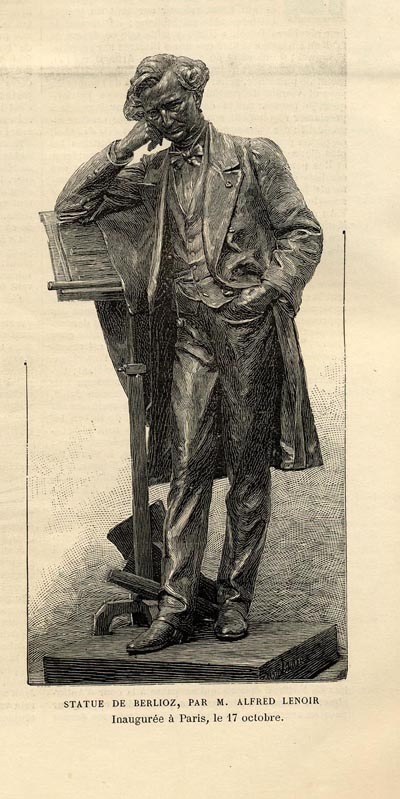 M. Alfred Lenoir has represented Berlioz standing, in an informal pose, his left hand in his trousers’ pocket and his right elbow leaning on a music stand. His head rests on his hand which is buried in his hair. The inscription at the front of the pedestal reads: "To Hector Berlioz, born at La Côte-Saint-André (Isère) on 11 December 1803, died in Paris on 9 March 1869". On either side the titles of his musical and literary works have been inscribed; on the right, the following works: The Damnation of Faust, Fantastic Symphony, Romeo and Juliet, Benvenuto Cellini, Beatrice and Benedict, and The Trojans. On the left: the Funeral and Triumphal Symphony, Lélio, the Te Deum, Messe des morts, etc. Finally at the back are listed his literary and critical works: the Treatise on Instrumentation, Musical Travels in Italy and Germany, Evenings with the Orchestra, Correspondence, etc. Speeches were given by Messrs Ernest Reyer, Charles Garnier, Ambroise Thomas, and M. Sylvain, of the Comédie-Française, recited a poem by M. Ch. Grandmougin entitled: To Berlioz. See also on this site Ernest Reyer’s speech (in French) at the inauguration ceremony. The Hector Berlioz Website was created on 18 July 1997 by Monir Tayeb and Michel Austin; this page created on 1 July 2007.